With only a few minutes leeway between rare and well-done, timing is key when cooking the perfect steak. You can choose between frying or grilling it. If frying, then a heavy-duty, thick-based frying pan, ideally with a non-stick coating, will achieve great results. It’s very important to consider the size and weight of your steak before calculating the cooking time. Once cooked, the steak should rest at room temperature for at least five minutes – it will stay warm for anything up to 10 minutes. Whilst resting the fibres of the meat will re-absorb the free-running juices resulting in a moist and tender finish to your steak. Step 1: TEMPER: Bring the steak to room temperature. Step 2: PRE-HEAT: Heat the grill or frying pan to a high temperature. A hot grill or pan is key to achieving great results. Step 3: SEASON: Rub with salt, pepper, oil, garlic & herbs. Step 4: TIMING: If frying, don’t be tempted to put your steak in too early. 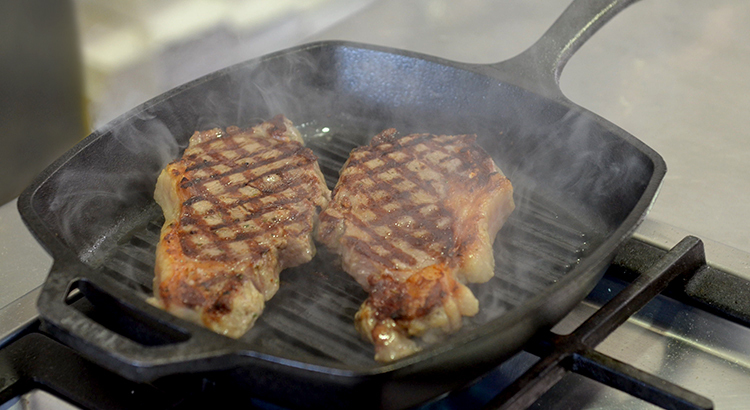 If the oil in the pan is too cool, your meat could turn out greasy and under-browned. Step 5: GRILL: Cook to medium-rare (or to your liking) turning every minute for 6 minutes. Step 6: REST: A cooked steak should rest at room temperature for at least five minutes. Let the steak rest in its juices. Step 7: CUT: Use a good quality sharp knife to cut into the steak. Serve with excess juices for a tender, more flavoursome steak. Blue: The steak should still be a dark colour, almost purple, and just warm. It will feel spongy with no resistance. Rare: The steak will be a dark red in colour with some juice flowing. It will feel soft and spongy with slight resistance. Medium-rare: The steak will be a more pink colour with a little pink juice flowing. It will be slightly soft and spongy. Medium: The steak will be a pale pink colour in the middle with hardly any juice flowing. It will feel firm and springy. Well-done: The steak will only have a trace of pink colour but not dry. It will feel spongy and soft and slightly springy. Like the advice ; thanks.